Hi guys! Over 9lbs!!! One for the force! Thought I'd sent in this pic! He had a go at a dark nymph after a few casts sight Fishin to him! He only looked like a 5 plus pounder in the water casting at him! But they always look smaller than they are! Had both very young daughters watching from the bank in last minutes of light! Took over 20 mins to land. 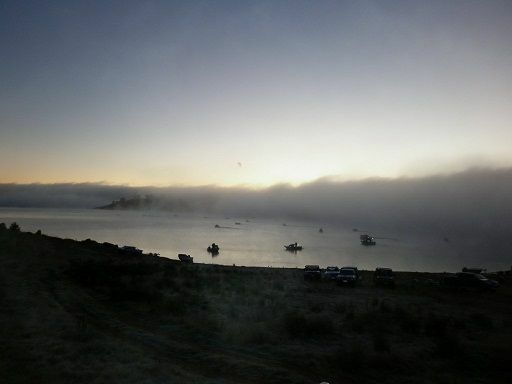 Livin the dream here in East Jindabyne!!! 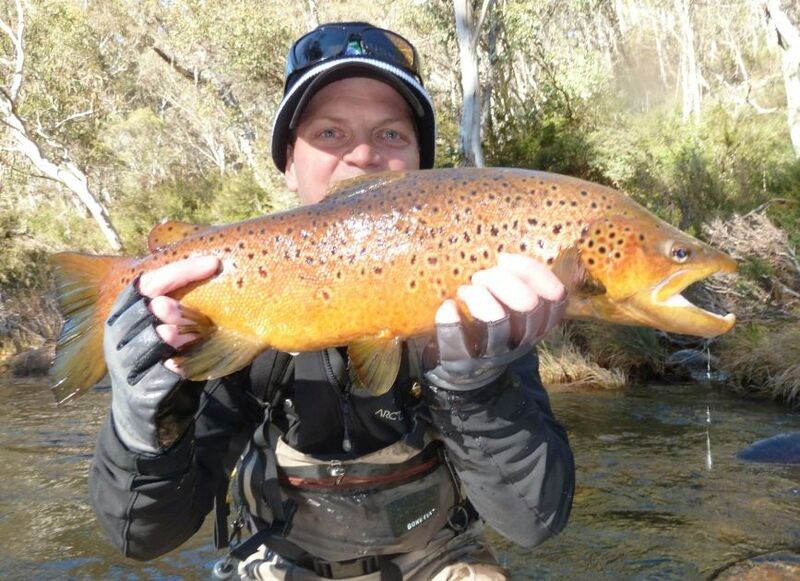 Rivers:- most spawning rivers are fishing well with good numbers of Browns running up the Eucumbene and Thredbo with many reports of fisherman catching fish up to 8lb plus. Remember the weather can change quick so take warm clothing and let someone now where your going best been safe then sorry. Hey guys, had a cracking day on the Euc last Saturday. Caught a dozen or so between 2-3lbs on nymphs and globugs including these two beauties both taken on dark nymphs. 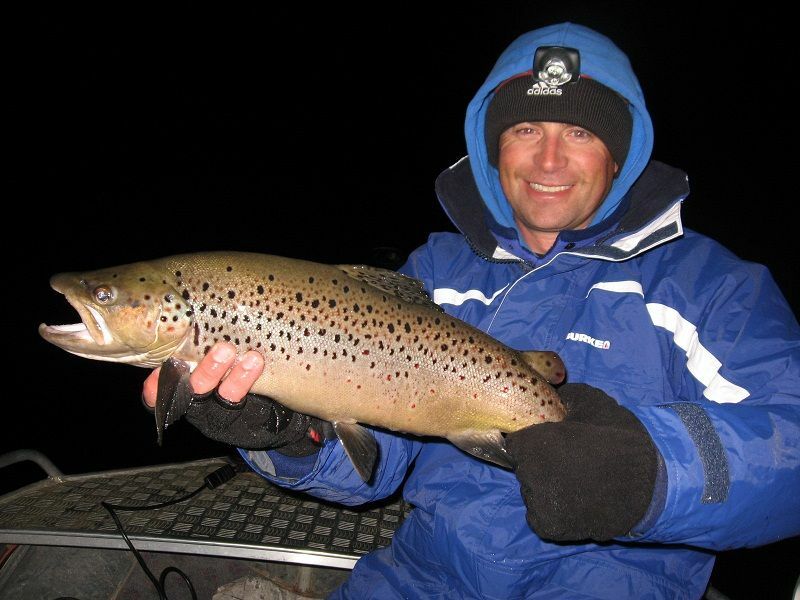 Brown was 6lbs and rainbow 4.25lbs in the weigh net before release. Remember the fish have been feeding all day so get out there and have a good day my best tip is on the lake with a Klinkhammer or Mrs Simpson the Browns and Rainbows are going mad, there fat and hitting hard. 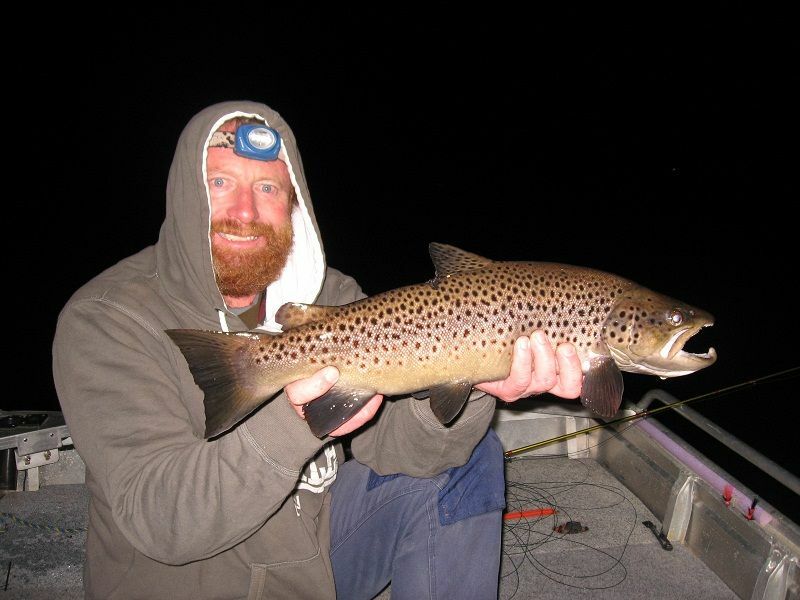 more good reports are coming from around Rushys and seven gates using black woolly bugger, black Nymphs with a very slow retrieve. Most fish are still rolling around on top off the water so when you see this the best fly to use is a Klinkhammer Olive we have been getting good Results. I bank fished the Providence Arm on Saturday evening. 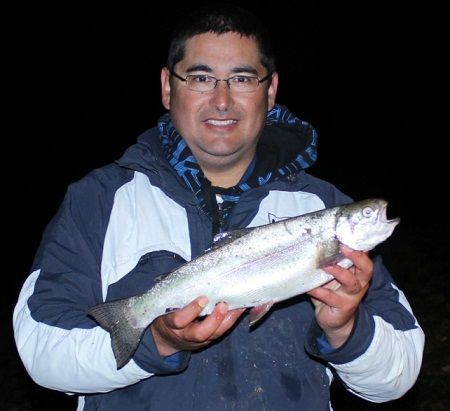 Within the first ten minutes, I landed a pan size rainbow on a yellow berkley salmon egg but then nothing for most of the evening. A couple of guys who also fished the same stretch of bank caught six pan sized rainbows on chunky cheese power bait. 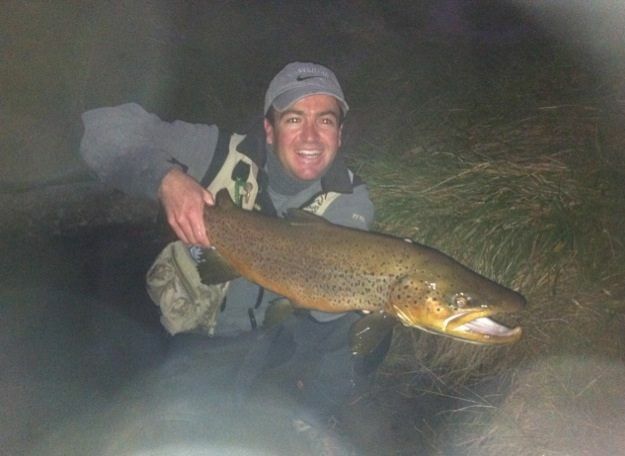 I eventually landed a 1.08 kg rainbow on lime twist power bait just before 11 pm. 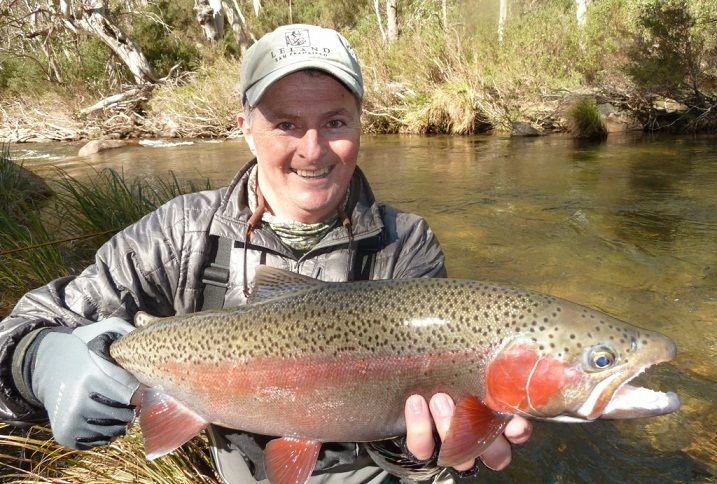 Warren caught a nice rainbow on a Tassie Devil green bumble bee no33 it weighed 1.93kg at 52cm in length and in excellent condition. On the bank the orange powerbait and chunky cheese were doing very well there were browns caught again with orange pulp and up to 1kg rainbows, we have had good reports all weekend here at Buckenderra. Fly fisherman have said that there are plenty of fish about with a lot of midges on top of the water but it has been hard work catching them they were using small midge patterns with red tips. 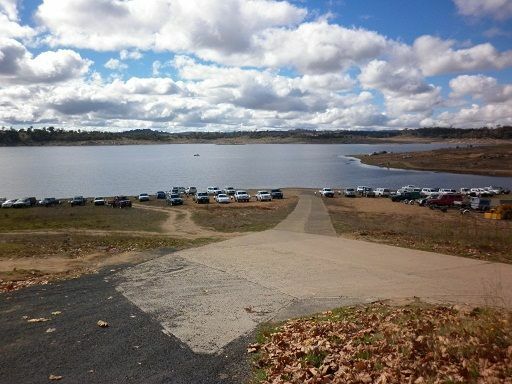 Eucumbene:- Reports from the lake have been ok.Launching access is available at Old Adaminaby, Anglers Reach, Dam Wall and Buckenderra . With cooler conditions there should be a few more fish taking shallow running minnows and Tassie Devils, strike pro blades and XRap Rapalas, RMG Scorpions this week. Two guys venture far off the beaten track in their quest for large tarpon.Armed with fly rods and float tubes their journey takes the viewer into some of the most beautiful and remote parts of Central America - a place where giant tarpon prowl and the locals fishand hunt from dugout canoes.The adventure unfolds as the catch of a lifetime is doucmented with incredible footage of exhilarating close-up fights with giant tarpon.Breathtaking scenery and wildlife as well as interraction with the locals.